After use, please leave your umbrella open to dry prior to closing. Please store inside, out of the sun. GINA & MAY long handled umbrellas are built to withstand windy conditions, but not gale force ones! 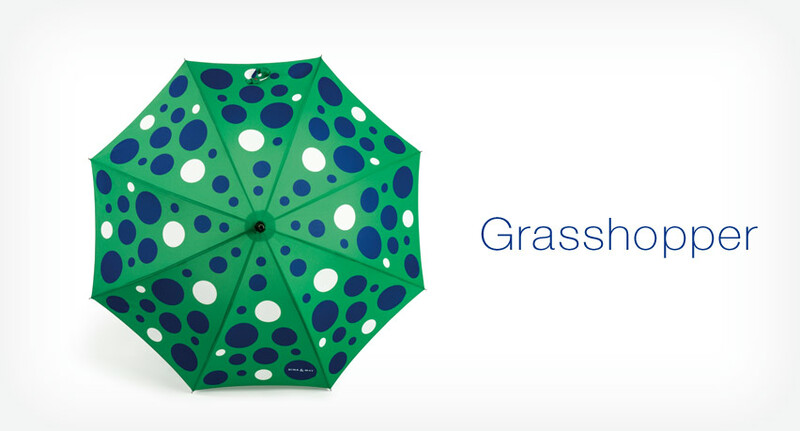 The long umbrellas feature a built-in windproof mechanism to minimise pressure on the frame. Thanks to the spring mechanism, the umbrella can easily be flipped back into place should it turn out on a windy day. The compact range from GINA & MAY is designed for normal weather. Please avoid taking it out in stormy conditions. Please open slowly. When opening the long handled umbrellas, be sure to open only to the latch and not push up any further. Whilst a GINA & MAY umbrella can double as a sun umbrella, please do not use it as a walking stick (to avoid any damage to the apex). The umbrellas are guaranteed for 1 year against frame defects that develop with normal use. The guarantee does not include damage resulting from misuse, lack of appropriate care or accidents.